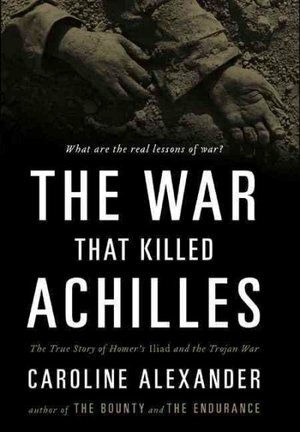 The War that Killed Achilles: the true story of Homer’s Iliad and the Trojan War By Caroline Alexander. Ms. Alexander, the author of The Bounty; the true story of the mutiny on the Bounty and The Endurance: Shackleton’s Legendary Antarctic Expedition, has written another riveting account of an historical event, even though the Trojan War is often thought to be mythical. Alexander reveals the story part by part, giving historical background and quoting the epic in large chunks. She explains where Achilles came from, why he is the main character, and why after two millennia we still read and remember this epic poem. I would recommend this for those interested in ancient history, and even for those who are just trying to write a paper on the Trojan War. It kept my attention, and I even looked up some of the footnotes. It turns out there is evidence that Aeneas really did go to the Italian peninsula from Troy. Posted on October 17, 2014, in Book Reviews and tagged Achilles, book review, Homer, Illiad, Lindsay Roseberry, Nonfiction. Bookmark the permalink. Leave a comment.